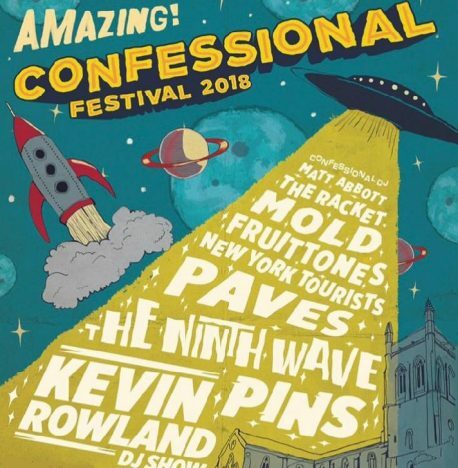 Book now: Confessional Festival 2018 – all-day music event in Blackburn. Mixing the sacred and the profane in early September is Blackburn’s Confessional Festival. So called because it takes place in a church, this is a 10-hour music and arts event which showcases some up and coming talent. On the bill are Glaswegian gothic post-punks The Ninth Wave; Liam Gallagher-endorsed Welsh rising stars Trampolene; and local indie ladies PINS. In addition to the young guns, the legendary Kevin Rowland, of Dexy’s Midnight Runners fame, will raid his personal record collection for a special DJ show. The confirmed music line-up can be found via the link below. The Festival is in its fourth year, and each time around it has a different theme. This time, it’s a celebration of all things ‘Out of this World’, meaning it’s a mix of kitsch mid-century sci-fi and space travel. There will be a curated mix of spoken word performances, live art, market stalls, food, and drink. For more music picks in Manchester click here.